Many office workers have found that working with more than one monitor makes them more productive. 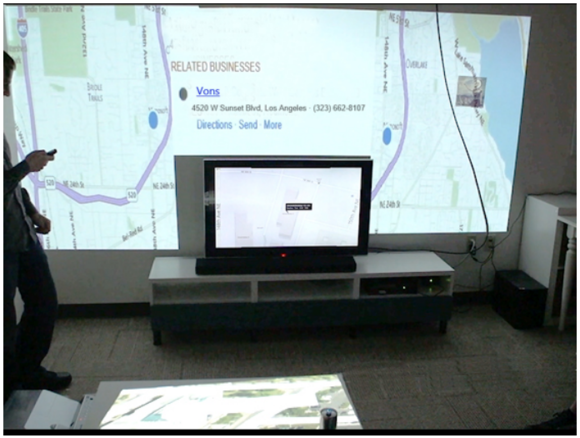 Microsoft’s SurroundWeb research prototype takes that to an extreme—a whole room. In a recently published research paper, Microsoft Research suggests that one or multiple projectors could beam maps, videos, games, or other images onto the various flat surfaces in a room. The software could also detect actual screens—such as TVs or phones—that could be used to interact with the content. If this sounds familiar, it is: Microsoft unveiled a similar Illumiroom concept last year. Unlike Google or a number of its competitors, Microsoft tends to publish its research, both to spark ideas and to foster an atomosphere of openness. There’s no guarantee that this technology will ever come to market, in part because of some of the potential privacy concerns the company identified. Still, it’s an intriguing concept, laid out in a public paper. The SurroundWeb technology starts by using a Kinect depth camera to scan the room, creating a “room skeleton” that’s similar to the “skeleton” the sensor creates when Xbox players are playing Dance Central, for example. The “skeleton” is the basic outline of what’s in the room: desks, chairs, the walls, et cetera. SurroundWeb then learns what projection equipment is available. Is it just a monitor? Or a projector and a monitor? Or both, with a phone as well? If a projector is available, that’s when the magic starts to happen. As you can see from the accompanying art, content can then be displayed on flat surfaces. So-called “satellite” screens, such as monitors, can display higher-resolution “main” images. Phones can be used for interacting with the content, as well as hand-waving gestures from the user himself. And if a user were playing poker, for example, her private hand of cards could be displayed on her phone, with the table shown on the main wall. 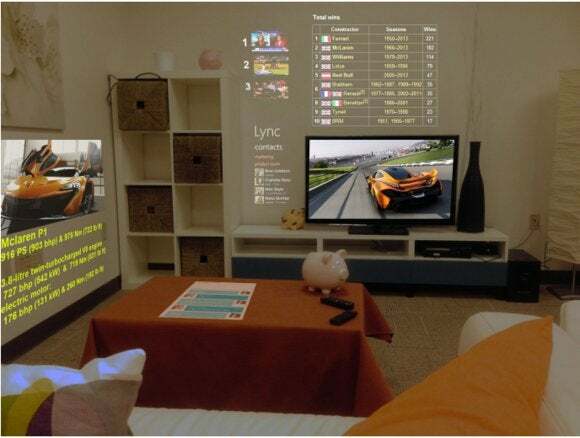 Microsoft’s implementation of SurroundWeb is designed to enable “least privilege” for these sort of immersive room experiences. What this means is that the Web site is allowed to know some of the attributes of the room in order to best render itself, but not everything—no one wants a retailer Web site identifying your high-end furniture, then jacking prices accordingly. But it’s not perfect: The technology can’t get around sites that ask you to identify objects in your room or take a picture of something. Microsoft has increasingly turned to massive displays, the better to showcase content. So what’s bigger than your room? After all, those walls are just holding up the ceiling.